Secure Business Communcations. 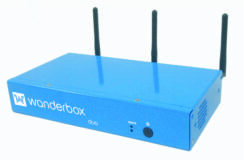 Router/Firewall + SIP/WebRTC Gateway + (optional) PBX + UC&C. SIP, Telco and WebRTC connnectivity solution for small businesses! Hardware obsolescence is so last season! Supports 4 concurrent calls by default, upgrade to 8, 12, 16, 24, 28, 32 channels! Add a Comma iTA unit for seamless telephony port expansion!